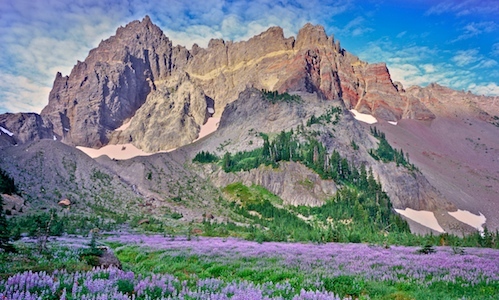 One of the most accessible alpine hikes in the Bend, Oregon area is the Canyon Creek Meadow Trail to the base of Central Oregon’s Three Fingered Jack. While Canyon Creek Meadow may not always look as beautiful the one below provided by the lovable guys at Pacific Crest Stock, it is always a worthy destination. It is also notable as a family friendly hike as the Bend Wild Bambina first managed the three miles into the lower Canyon Creek Meadow as a 5 year old. 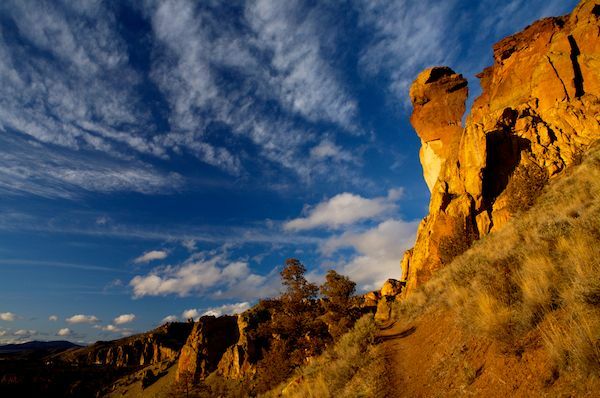 While this trail is no secret to locals, it’s amazing scenery and short distance make it a must for Central Oregon hikers. 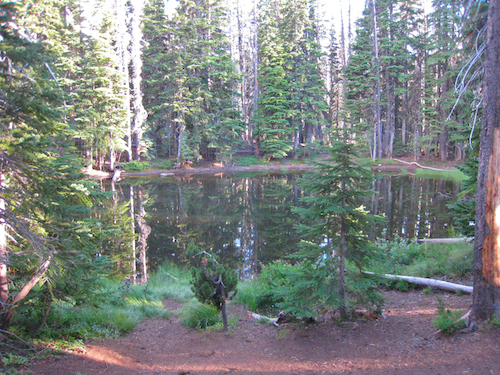 This trail starts at the “Jack Lake Trail” on the east side of the Pacific Crest near the idyllic town of Camp Sherman, Oregon. On sumer weekends, the parking lot can be full so arrive early or don’t attempt this hike on weekends between July and September. Below is the trail head on the edge of the parking lot. 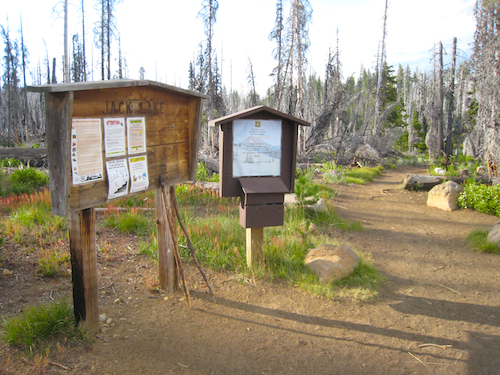 Be a good backcountry soldier and sign in at the trail head. You might also want to have your northwest forest pass visible as this parking lot is sometimes patrolled by the forest service and and it is clearly indicated that they are required at the Jack Lake Parking lot. The trail is obvious and leads off to the right as seen in the photo above. After a short 1/4 mile hike, Jack Lake can be seen off to the left. Jack Lake as seen from near the Jack Lake parking lot. At Jack Lake, damage from recent fires is very evident. 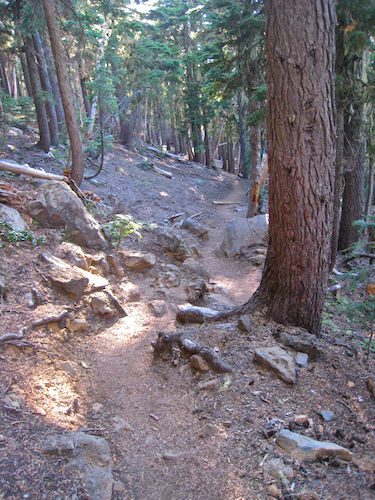 The first half of the trail to Canyon Creek Meadow is scarred with fire damage and with Beetle damage. As in other areas of the Oregon Cascades, Pine Borer Beetles have wreaked havoc on Lodgepole pine stands. 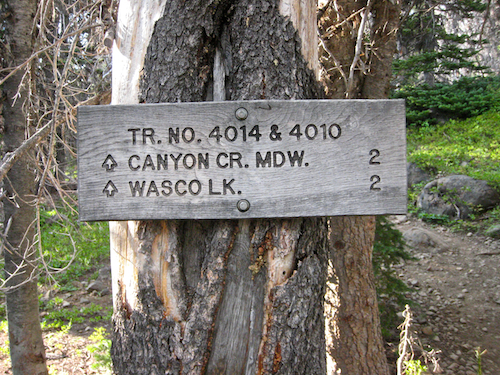 Trail signs pointing to Canyon Creek Meadow. After a mile of moderate uphill hiking, you’ll see the above sign which according to my best estimate is about 2 miles from Canyon Creek Meadow. 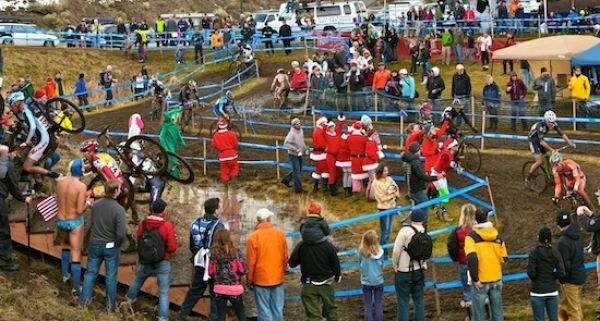 Eventually the trail will fork. At that point, continue onward towards Canyon Creek rather than traveling downhill towards Wasco Lake. The next 3/4 of a mile is heavily littered with downed lodgepole pines which are the victims of Forest fire and the sinister pine borer beetles. Trees are simply laying everywhere like our friend Jake on a Saturday night! Below is the kind of deadfall that will be present on the trail(not on a date with Jake). 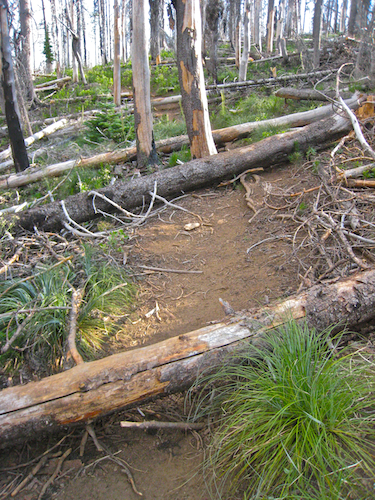 Deadfall littering the trail on the way to Canyon Creek Meadow. The location of this deadfall is unfortunate as the trail climbs steadily here. 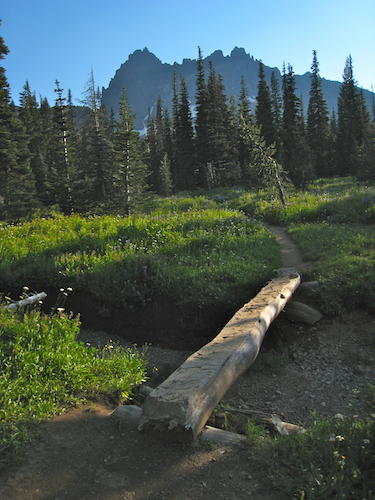 Shortly after the deadfall subsides, a couple of alpine ponds appear on the left side of the trail. While the ponds are attractive, they are are absolutely laden with mosquitoes, like Jake’s hot tub is laden with……..Water. Alpine Pond along the trail along to Canyon Creek Meadow. Beyond the ponds, the trail descends noticeably and the the deadfall is wonderfully absent. While the trail is somewhat rough, it is very obvious. After the descent is an inevitable yet short climb. A small dry meadow awaits near the top of the climb. 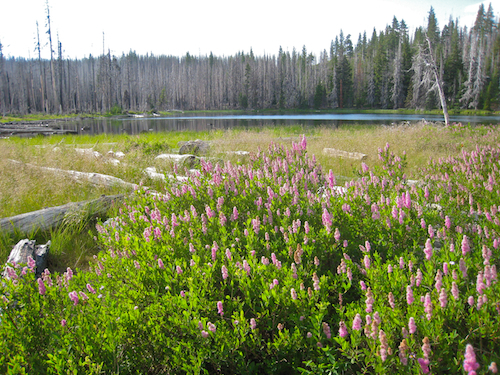 If you are lucky enough to hike this trail in late summer, the meadow will likely be carpeted with lupines as seen in the photo below. 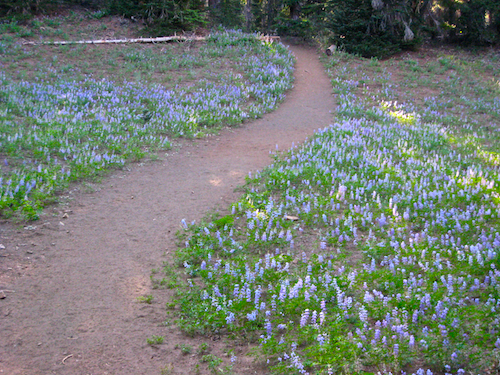 Lupine lined trail in route to Three Fingered Jack, in the Mt. Jefferson Wilderness. At the meadow, you are about to see the alpine light. From hear the trail is level, beautiful and improving with every step. You are very close to one of Oregon’s more iconic hiking locations. In fact you are very close to the following scene capturing Three Fingered and a small foot bridge at the bottom of the lower Canyon Creek Meadow. Footbridge in the Lower Canyon Creek Meadow with Three Fingered Jack in the background. At this point, you should prepare to be wowed. 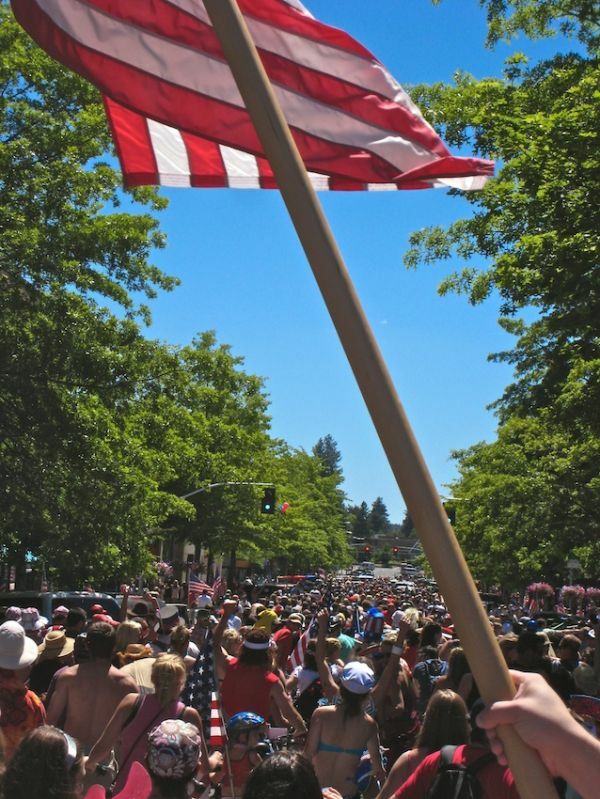 Trees in the meadow thin and the wildflowers thicken, like tourists crowding the Bar at the Deschutes Brewery! This meadow is the best place for camping if you are planning an overnight trip. There are many pleasant options, so don’t be afraid to explore for sites slightly off of the beaten track. The intrepid hiker should proceed onward from here. The meadow is about 1/2 mile long. With an additional 1/2 mile of fairly strenuous uphill hiking, you will receive one of the most beautiful scenes in Oregon. The Upper meadow is a smaller stream and wildflower laden version of the the lower Canyon Creek Meadow. 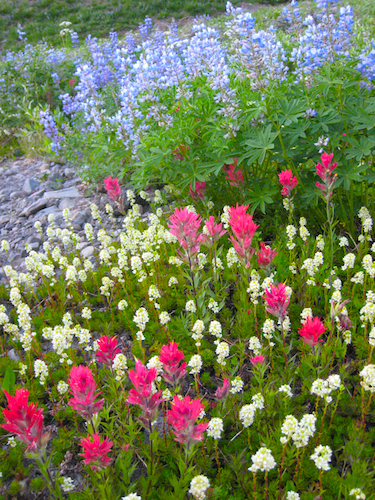 Below is a small sampling of the wildflowers to be found in the Upper Canyon Creek Meadow at the base of Three Fingered Jack. 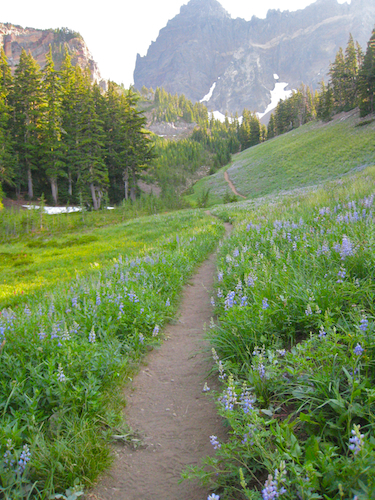 As you climb upward toward the Upper Meadow, pay attention to the views off to your right, as the trail tends to carry hikers past the upper meadow towards a small but very scenic Moraine Lake right at the base of Three Fingered Jack. I recommend a stop in the upper Canyon Creek Meadow before proceeding to the alpine lake. 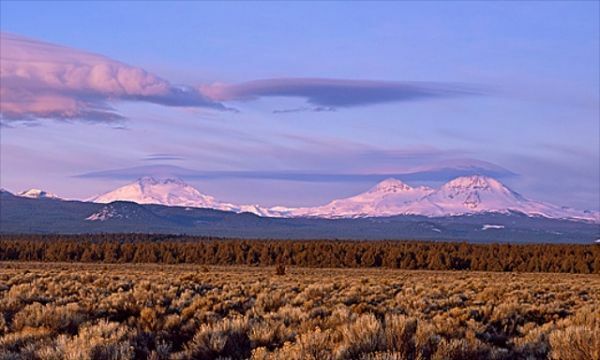 The meadow with the distant Three Fingered Jack, as seen below simply begs for exploration! Predicting wildflowers is a crapshoot. Late summer is a good bet though. Some years are disappointing, while in other years, the wildflowers rival the best that you can find anywhere in the Pacific Northwest! 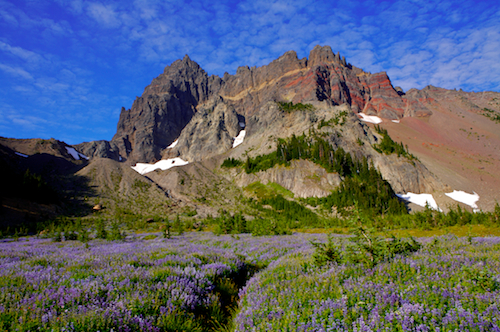 for some truly amazing Three Fingered Jack photos follow this link . Oregon Mountain Photos. From the Upper Meadow, the options are endless. You can proceed up along the shadow edges seen in the photo above to reach the aforementioned Moraine Lake, or you can climb up to the right(North) and explore the Pacific Crest Trail which skirts above the Upper Canyon Creek Meadow. One reminder, Mosquitoes can be fierce in summer, so stock up on Bug Dope. 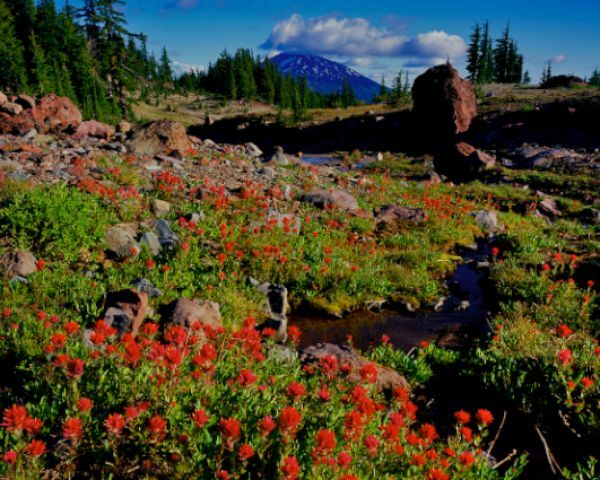 This trail is a phenomenal day hike to one of Oregon’s most beautiful Alpine Basins. The fact that the trail to the Upper Meadow is only 4 miles is icing on the cake. As always tread lightly, and pack out your debris. This is simply too beautiful of a place to defile. This was the most amazing day of my life. Never seen so much beauty hiking these trails! It is a must for all avid hikers! Sally, thanks for the note. Three Finger Jack via Canyon Creek meadow is a glorious hike, isn’t it? 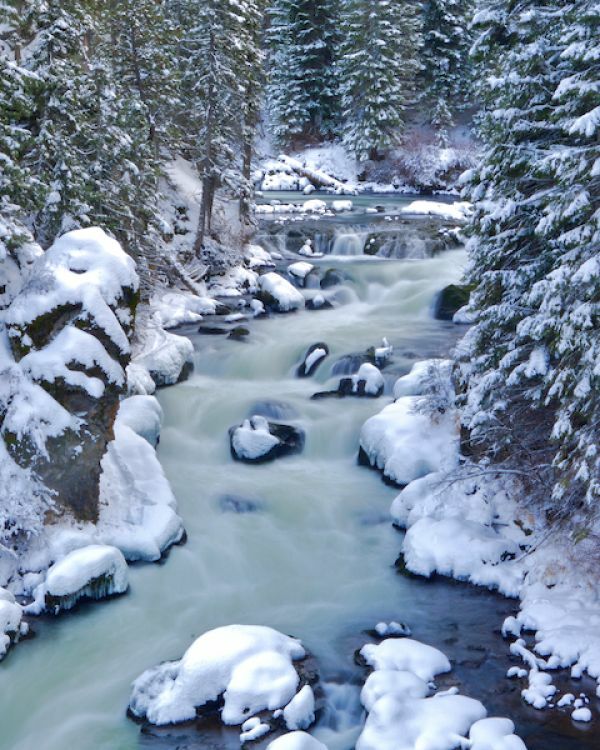 If you’d like to see some beautiful shots of Canyon Creek Meadow, visit this site. Mike Putnam Photography.